Saturday, January 30th arrived without temperatures of 20 below or the need for local guys to plow before coming to registration…a rarity and yet a pleasure for most! Sunday would have been a slushy mess and the earlier in the week’s snow would have been a disaster for most of the portable shanties. The dance on Blue Mountain to appease The Adirondack Ice Gods had produced 8-12 inches of reported ice on the lake. A sign declaring no vehicles on the lake and recommending against the north end, as the ice was not consistent, concluded the derby without incident for the 122 adults and 16 juniors who registered to fish. We have yet to cancel this derby and as usual—thank Mike for looking out for us from wherever he is. Beeba (Tom) Norris and Sandy Hicks showed at the fire hall shortly after 5:30 a.m. to handle the registration, which starts at 6 a.m. 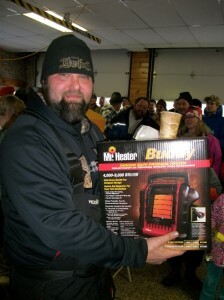 They were greeted by a line of people eagerly waiting to get a jump start on drilling their holes and getting the shanty space shoveled off and the Mr. Buddy’s fired up! Twenty pots of coffee later, the apple/maple scones (referred to by many as “the big warm cookies”) and the other breakfast offerings were disappearing into mouths and packs. I looked up to see that it was not yet 6:30 a.m. and Sandy Hicks remarked as she grabbed a quick coffee, 100 people had already registered. Hats off to her and Beeba because I could hear people asking questions as they turned in their registrations, of which they have to initial that they had read the rules. 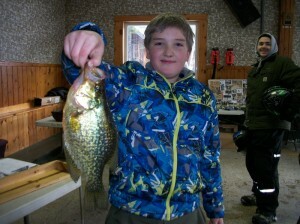 Is crappie in it? Yes…it’s in the rules. What’s legal size for lakers? 21”…it’s in the rules. What time do we have to be back? Last line out at 3 p.m., be at the fire hall by 3:30 p.m….it’s in the rules. How many times can I weigh in? The legal limits of the fish category…it’s in the rules. What time can we start fishing? 7 a.m….it’s in the rules. What do you do with ties? First by weight, then by length, then alive over dead and if it’s still a tie we add the money from both places and split it 50/50…it’s in the rules. Do you know where the fish are? Under the ice. Where’s the bathroom? Outside (pointing to the stairs) and the two doors before you get to the kitchen sink. He does make you smile…but then again, he’s a Norris. Wayne Kavanaugh, Fish & Game Club President stopped in with the prize money and envelopes (very organized as I had again forgotten the envelopes) and offered to help with registrations. Sandy had time before she had to get to the Tap Room to orchestrate a Saturday there, so Wayne left to return to his Piston Bully and finish making the happy trails to Raquette once again a smooth ride. The Junior Division was created to introduce and promote the sport of fishing to the youth and teach them to compete honestly. Juniors must catch and land their own fish. 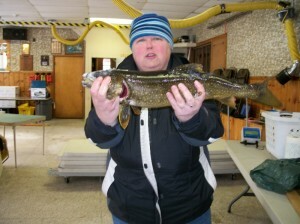 No brook trout or salmon were weighed in. Michael Lamphear – 21 3/8”, 3.17 lbs. Michael Lamphear – 14”, 1.64 lbs. Noah Lamphear -11 3/4”, .86 lbs. Alex Miller – 11”, .66 lbs. 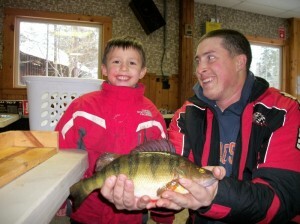 Zack Miller – 12 3/4”, 1.11 lbs. Michael Lamphear – 11”,.77 lbs. Michael Lamphear -10 3/4”, .63 lbs. For the second year, no salmon were weighed in during the derby. It doesn’t mean there aren’t any salmon; it means there wasn’t anyone fishing for or smarter than the salmon on this day. Gary Lee – 26 1/2”, 6.25 lbs. Wes Keays – 24 1/4”, 5.0 lbs. Jamie Roblee – 23 7/8”, 3.75 lbs. 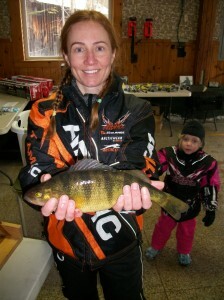 Jamie Roblee – 17 1/8”, 1.68 lbs. Savannah Lamphear – 14”, .97 lbs. Jason Scott – 12 1/2”, .65 lbs. Jen Temple – 13 5/8”, 1.40 lbs. James Kilmartin – 13 1/4”, 1.32 lbs. 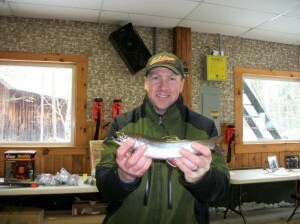 Craig Lamphear – 13 1/2”, 1.19 lbs. Robin Reese – 13 1/4”, 1.38 lbs. Louis Sowich – 13 3/8”, 1.34 lbs. Murray Lamphear -12 1/2”, 1.06 lbs. We would like to thank Tioga Construction Company of Herkimer, Mike’s former employer. Every year they donate money that helps pay for door prizes. 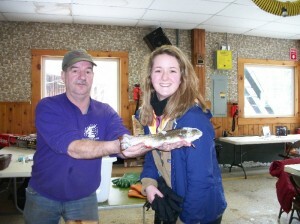 Thanks to Burke’s Marina in Raquette Lake. Mike shops and wisely spends the money to obtain an ever-changing and great variety of door prizes, plus throws in a few extra goodies as a donation. Nora Burke, Kevin Norris and Cindy Corrow (Norris) for showing up early in the morning and staying the entire day, helping with the running of the event (weighing in, taking pictures, counting money, making up the envelopes), as well as helping in the kitchen and running to the Raquette Lake Mall to get what we might need from the store or Tap Room to run smoothly. Sandy Hicks for help at the registration table, Wayne Kavanaugh for the banking run, Lew Harrington for helping with the door prizes and dragging the fish-weighing scales to Raquette after I couldn’t squeeze them in my car, Karen Lamphear for helping with Club memberships and Liz Forsell for her expertise in squeezing (in an hour!) every last dollar out of the people standing in the fire hall to make the 50/50 raffle total over $500. 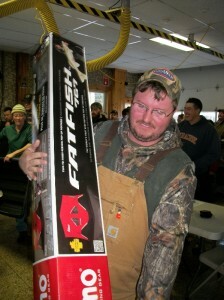 TJ Ratigan won $260 and donated part back to the Raquette Lake Fire Department. And hats off to the Raquette Lake Fire Department…they found the vehicles warm homes around town in case they needed to perform. Also for letting Fish & Game Club use their warm building with running water and bathrooms and allowing us the use of the “new stove,” which was awesome! And thanks to Andrea, Jessie, Aris, Kat and Kurt of The Tap Room, who help the clueless and the newbies get through another year of questions, handing out registrations and two delightful days in Raquette Lake! Written by: Theresa Taylor on February 4, 2016. Last revised by: Gina Greco, our reviewer, on February 15, 2016. 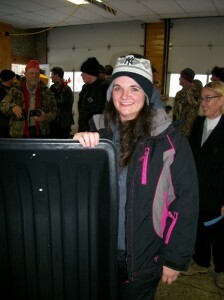 This entry was posted in admin and tagged Mike Norris Memorial Ice Fishing Derby on February 4, 2016 by Theresa Taylor.